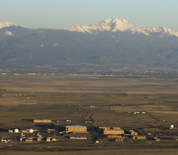 Schriever AFB is located near Colorado Springs, Colorado and is home to the 50th Space Wing of the Air Force Space Command. The 50th Space Wing serves as host unit and is also responsible for managing the Global Positioning System and for tracking and maintaining satellites for the Space Command. Additional units on base include the Missile Defense Integration and Operations Center and the Space Innovation and Development Center. Some facilities that support Schriever are located at the nearby Peterson AFB. This Schriever AFB directory features the critical info you’ll need to navigate through the many facilities and recreational opportunities available on base.